Water is free when it's rain, so is sunlight. Why not put the two together and build a sustainable irrigation system - here's how I got it going. In the early spring of 2011 my wife started a new garden at our house in North Carolina. Once all the tilling and planting was done, we needed a watering system (aka drag a hose to the end of the lawn). Seeing a bump in our water bill and running hoses back and forth got a little old, so I wanted to design a sustainable irrigation system. To the drawing board and time for a project! The goals of the project were pretty straight forward. Why you ask? Well because everyone needs a backup plan for irrigation during a complete power and city water service interruption! Just kidding, this project started by looking into renewable water resources and adding the solar power just seemed to fit better with the overall theme it took on - plus it turned out pretty cool, it's off the grid and all completely renewable. [Queue "Go Green" chant here]. This could easily be adapted for remote locations etc..
First I set off looking at how other people had accomplished rainwater systems. I found that many used reclaimed 55 gallon barrels to store rainwater. Although this is a great idea, I needed more storage space so I quickly started looking at larger containers. I went with a 400 gallon polypropylene tank that I picked up locally from a farmer that used it for water only. Before running across the tank I considered using standard IBC totes, which allot of people seem to be doing with good success - I recommend finding some of those totes if you cant get your hands on a good tank. 45 minutes of decent rain fills my 400 gallon tank so don't think you wont have enough water to fill the tank you choose. More specifically 1 inch of rain on a 1,000 square feet roof yields 623 gallons. The one consideration I will also mention is factor in how much your tank will weigh full. Water weighs 8.35 lbs per gallon, so at 400 gallons full my tank weighs in at a hefty 3340 lbs (or as much as a typical mid sized car). I would NOT suggest setting that on your deck, support its foundation well. Now that I had a tank, mounted in position under a good gutter downspout - I started looking at pumps. 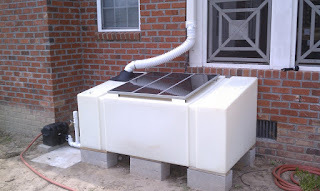 Many small residential rainwater systems rely on gravity to feed a small spigot. As you can see on the left I incorporated that also but I needed high pressure across a long distance so a good pump was necessary. Unbeknownst to me when I started this endeavor pumps are apparently science into themselves, and before this I was completely uninitiated. After speaking with several pump vendors, finishing the internet (yep, the entire internet), and an honorary degree in hydrodynamics I decided on a 12v on demand diaphragm pump. Basically what this means is when the pump detects a drop in pressure on the hose side (sprayer nozzle open) it starts, when it builds up pressure (sprayer nozzle closed) it stops. 12v because I would be running it off a deep cycle battery charged by solar and on demand so I wouldn't have to explain to anyone how not to burn up a pump. probably a little overkill. Its pumping 7 GPM @ 60 PSI - it works great. To power the system I picked up a deep cycle marine battery, 45 watt solar panel and regulator. I got a great deal on the panels from Harbor Freight, so far so good and charges well even in not optimal sun conditions. I wired the regulator into my sunroom where I added a small 300watt A/C inverter to also use the free solar power for a lamp or radio when I'm hanging out on the porch (an outlet on the porch was something the builder apparently forgot but that's another story). The regulator obviously also feeds the marine battery keeping it fully charged for the pump. All these electronics I stuffed in a little cabinet to keep it dry and monitor the charge etc. I mounted a power switch on the battery box to start up the pump and wired it all up. elements so I mounted it into another battery box. According to the manufacturer it also had some tendencies to overheat so I wired in a small 12v fan from my computer grave yard parts bin. It seems to keep it cool enough for the service its done so far. In lieu of a first flush system that diverts the first 10-20 gallons of water into a reserve tank (for cleaner water) I grabbed a small skimmer basket from my local pool supply store, a tiny one at around 6" across that fit perfectly into the tank opening. I then put a filter sock in the skimmer basket (pool store had those also). So far pretty good filtration for all but the finest particulates and is really easy to pop out and clean. I may eventually build a first flush system however. 3/4" sprinkler head throws water 40' (A=π *r² )- so that's irrigating over 5000sq ft off a solar charged pump! Although this is a high level overview of the entire design and build hopefully it will help you with your own sustainable solar powered rainwater system, good luck and have fun building something. If you read this far, you should follow me on Twitter!